I wanted to bring AAFCPAs, a best-in-class CPA and consulting firm, to your attention. The Boston accounting firm announced that they will again participate in Giving Tuesday (November 28th). In addition to what AAFCPAs is doing for Giving Tuesday, they're dedicated to helping nonprofits year-round with its "10% back to nonprofit" program, giving 10% of the company's annual net income back to nonprofits. AAFCPAs is delighted to share the findings of this survey with you, and would like to extend our gratitude and thank all who participated and contributed to this study. New 2018 administrative data is here! 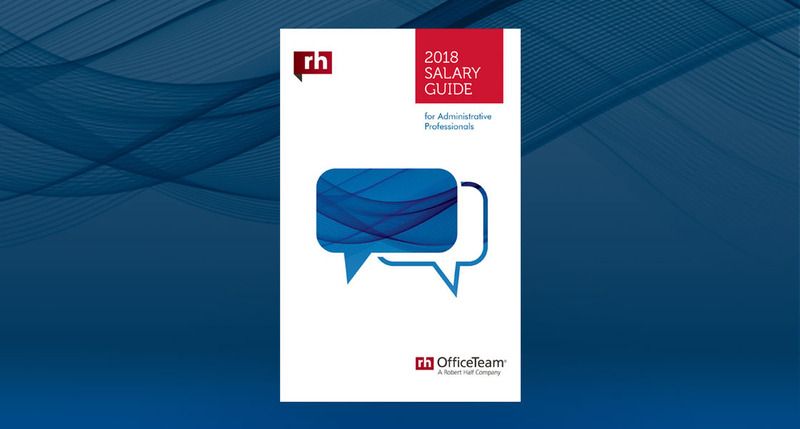 Get the latest salary insights from OfficeTeam. In today’s market, many companies compete to hire the same highly skilled administrative professionals. That’s why we publish our annual Salary Guide: to help employers like you get the edge on hiring those sought-after employees. © 2017 OfficeTeam. A Robert Half Company. An Equal Opportunity Employer M/F/Disability/Veterans. For more information, visit www.roberthalf.com/officeteam or call 1.844.700.8028. Westborough, Mass. (September 5, 2017) - AAFCPAs, a best-in-class CPA and consulting firm known for assurance, tax, accounting, wealth management, valuation, and business and IT advisory solutions, announced today it moved its headquarters to a larger office space located at 50 Washington Street in Westborough, MA. The new space is approximately 18,964 square feet, 5,000 square feet larger than its current headquarters. The new space accommodates the Firm’s recent growth and offers a collaborative, technology-rich, and inspiring workspace. Employees will enjoy a larger headquarter, with modern touchdown spaces, amenities and décor that reflects the Firm’s brand. Additionally, renovations of the new space include the addition of a recording studio. The studio is designed to enhance and evolve the content developed to share the Firm’s insights and expertise, which is highly regarded by its clients. Architecture firm, Walsh/Cochis Associates Inc. spearheaded the office space’s remodel, and AAFCPAs’ client, Walker Development executed the construction. The space contains 26 offices and 8 conference rooms, including the addition of a training room. The Alexander Training Room is named in honor of founder Herb Alexander and celebrates the Firm’s core value of continuous learning. AAFCPAs is an independent member of PrimeGlobal, Inc. This provides seamless national and global reach for our clients, as well as access to the resources of the fourth largest CPA firm association in the world. Our pay-as-you-use model is considered advantageous by our diverse clients who appreciate exceptional value. In a recent Robert Half Management Resources survey, workers were asked what skill they think their manager needs to improve most. The top response, cited by 30 percent of workers, was "communication and diplomacy." An even higher percentage of millennial professionals (36 percent) said their bosses need to improve communication and be more diplomatic. This first step can be tough, but you need to find out what others really think about your communication skills. Ask your staff, colleagues and supervisors to share a frank assessment of your writing, speaking and presentation abilities. Explain that you want to refine these crucial skills and would welcome all constructive criticism. If you sense your employees might be hesitant to provide feedback because they fear negative repercussions, consider conducting an anonymous survey. One size does not fit all when it comes to effective communication. Good leaders understand the diverse needs of their staff and tailor their messages accordingly. Good communication is especially critical during major endeavors like a merger. But it can be tempting, with everything else you have to do, to eschew “nonessentials” like one-on-one meetings and staff updates. In this era of open office-spaces and remote working, a literal "open door" policy may not be relevant. However, the concept of keeping the door open to communication is still very much applicable in the modern workplace. AAFCPAs Wealth Management, an affiliate company of AAFCPAs, continues to grow and is pleased to announce the addition of Andrew Hammond, CFP® as a Wealth Advisor and Director of Wealth Management. Andrew joins our growing team of advisors after 17 years in financial services at Fidelity Investments. Andrew sought-out AAFCPAs Wealth Management in response to the evolving retirement landscape. “With the implementation of the Department of Labor fiduciary rule, investors will now need to determine if the investment professional they work with is acting in their best interest and is a fiduciary,” said Hammond. Andrew joined AAFCPAs Wealth Management in recognition of the firm’s fiduciary-based wealth management promise. Industry Week | AAFCPAs' partner Jack Finning offers guidance for company owners preparing for a sale or transfer of leadership. "They must be able to clearly and effectively communicate with the next generation about how to best steer the organization through these choppy waters." The massive wave of boomer retirees is pressuring leaders from the manufacturing industry to both properly address their pending succession plans and devise a system to retain and attract new leaders from younger generations. In an environment charged with uncertainty, boomers are tasked with presenting a compelling case for the new guard to stay in — and lead – the industry. AAFCPAs is excited to announce the release of our 8-part educational podcast series offering actionable takeaways for organizations to improve efficiency, effectiveness and performance controls. This collection of podcasts is the 2nd series of recordings from AAFCPAs’ Annual Nonprofit Educational Seminar. These podcasts, and accompanying introductory videos, feature full audio of thought-provoking sessions recorded on May 3rd, 2017 in front of a live audience of 300+ nonprofit executives and board members. Several sessions may be equally valuable to AAFCPAs’ commercial company clients. Westborough, Mass. (June 20, 2017) - AAFCPAs, a best-in-class accounting firm known for assurance, tax and advisory solutions, recently announced Greg Bielski joined the firm as its Chief Financial Officer (CFO). With over 30 years of comprehensive financial management experience, he served as a CFO and finance executive for entrepreneurial commercial businesses in previous positions. Over the past three decades, Greg has demonstrated a keen ability to strengthen financial reporting, streamline operations and drive profitability. He brings to his role at AAFCPAs a proven track record of controlling costs and expenses, optimizing tax, managing compliance and financial risks, and optimizing IT performance for growth opportunities. Greg is responsible for executing the firm’s financial strategy, and his diverse talents will contribute to and guide the firm’s continued & sustainable growth. A Bentley University alumnus, Greg serves his community by volunteering as Chair of the Membership Involvement Committee for Financial Executives International (FEI) - Boston Chapter and is Treasurer for the Broomstones Curling Club in Wayland, MA. To learn more about Greg Bielski, CFO, click here.